The ferry Sinaburg with hundreds of passengers stuck in reef at Banda Sea near Tual port in Indonesia and started sinking. The vessel was en route from Ambon to Tual, but about 7 nautical miles off the destination port, hardly aground in a reef, suffering breaches, water ingress and started partially sinking. The crew reported the accident immediately to the local authorities and was organized large-scale evacuation of the passengers. After several hours, all the people from the troubled ferry were transferred to rescue boats and nearby vessels. There were no reported injuries from the people, as all were disembarked in Tual port without reported serious injuries. “Thank God that the evacuation of passengers has been completed. 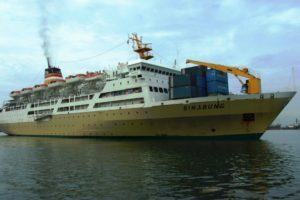 There are no passengers and crew remaining of the ferry Sinaburg”, said the Chairman of the Marine Response Team, Yanto Durianto. The ferry rested on bottom in reef shallows. The salvage attempts were unsuccessful and will will be considered at further stage, as probably will need to patch the breaches and be held an underwater survey. The ferry Sinaburg (IMO: 9139672) has overall length of 146.50 m, moulded beam of 23.70 m and maximum draft of 6.00 m. The deadweight of the ship is 3,485 DWT and the gross tonnage is 14,716 GRT. The ferry was built in 1997 by Meyer Neptun Papenburg shipyard in Germany.